Hello all. Last year, even though I got off to a very late start it was my first attempt at SFG. This year I plan to do things better and get started with a good plan first. 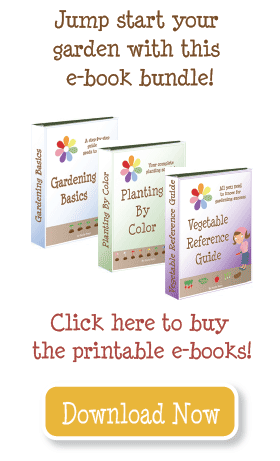 My family is in the SW burbs of Chicago in Plainfield, IL and we have decided to get more involved with gardening. Last year we started off with 2 3 x 6 boxes. With the late start and us learning, we did a lot of trial and error not to mention we pick a very hot and dry summer to start. We did end up with some nice lettuce, greens (mustard and turnip) along with banana peppers (favorite when pickled). The other peppers were just so so and the same goes for the corn. As for the tomatoes, we gave each (Big Beef and Roma) 4 squares, but should have probably gave them each 9 as they were huge. We did get lots of great fruit from each, but placement has to be better this year. This year, we are adding 2 4 x 8 boxes each with a trellis as described by Mel. Currently I am thinking of alternating squares on the trellis, but I’m having second thoughts and thinking of grouping what I have on the trellis, but keeping the cucumbers in separate boxes and pruning the Big Beef tomatoes. I tried to color code my plan as well with Blue/Greenish for cool weather and Orange for summer crops. The light vs dark shade is so that I plant similar crops 1 – 2 weeks apart. Any feedback and/or suggestions would be great. Ed, I would suggest you check out you tube videos for proper technique of pruning your tomato plants. You need to take the suckers off but make sure you do it correctly or you won’t get good fruit production from the plants. Big Beef tomatoes are indeterminate varieties which means they will get very large—-they will grow until frost kills them. You need to sucker them and stake/cage/trellis them to control their spread. With proper suckering you’ll be able to maintain the size/spread without compromising its fruiting capacity. Ed, Thank you so much for your response! My neighbor said she had problems with birds getting at her new seeds, so I had my husband make a “cage” that will go over the top and can be removed. The cage won’t be able to stay on though for a long time, because it’s only a few feet tall, and when the plants grow past that… I’ll probably have to use your method with the chicken wire. As for Mel’s Mix… I went to Tri County Stockdale on Black Road and got my ingredients. They had a big 4cu.ft. bag of vermiculite… I bought a couple 2.2 cu. ft. bags of peat moss, and I got one 25 pound bag of humus/manure compost. I need more compost so I’m going to go to Home Depot and just buy a few different bags of different kinds, like the book suggests. I’m starting small and only doing one 4×4 box this year… and will do more next year. 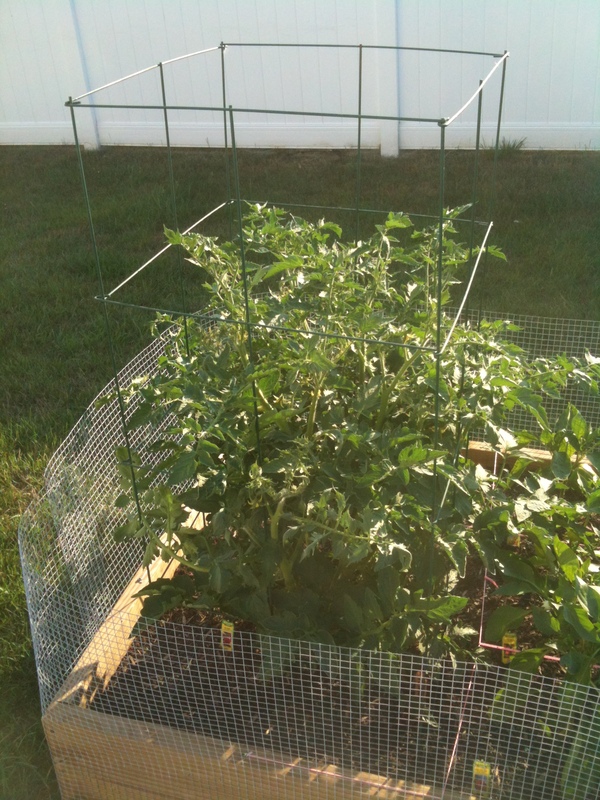 My husband built me a trellis too, so hopefully I’ll get lots of good tomatoes… and sugar snap peas! Looking forward to seeing pictures of your garden this year and I’ll post pictures as well. Good luck! It’s good to meet others that are close by. Last year was my first year, so I’m still learning too, but I would be happy to share my experience. Even with this being my second year, I too have many many questions as well so I have no problem sharing my experience. 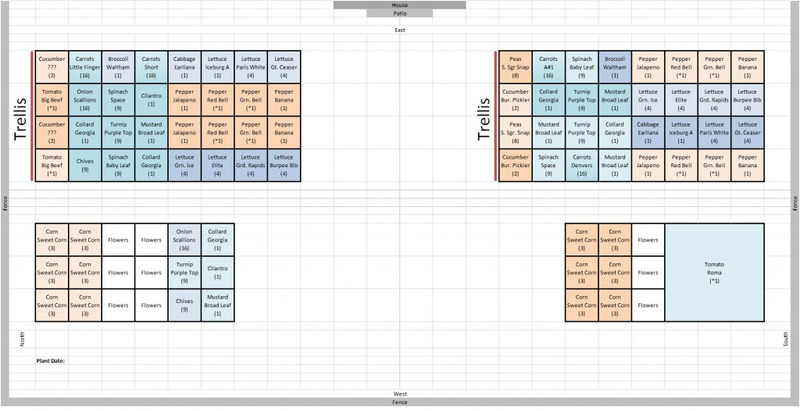 This year I’ll be building 2 additional beds with a trellis (see diagram) and I’m hoping to do that very soon, weather permit. I must admit though, I did not use Mel’s Mix. I used a combination of a particular brand name garden soil, top soil and compost from a local landscape business. I haven’t figured out if I will be using Mel’s Mix from my 2 new beds or will I do something similar to before. I know Mel’s Mix is better, but I had a hard time finding the quantity I needed. The only place I was able to find compost locally and fairly close was the landscape business near Lincoln Hwy (US 30) between Rt. 59 and Renwick. There is another landscape business close by on 142nd and Rt. 59. I haven’t tried them yet, but they are a second option. I’m probably going to plant my first crops in the group in about another 2 -3 weeks depending on the weather. Currently my soil is still hard so I will only plant once I’m able to work the soil. If necessary, I may have to put a tarp or some plastic over my beds to help warm the soil and be able to work the soil sooner. I’ve already started some seedlings so I will be transplanting my early crops rather than starting everything from seeds in the ground. 2. Did you put anything on the bottom of your boxes besides weed cloth (like chicken wire, or a wood bottom?) Just wondering about keeping out rabbits, etc. I stapled hardware cloth (thicker than chicken wire) to the outside bottom of my beds and then on the inside bottom I put a weed cloth that came slightly up the sides. My thought was to use the hardware cloth to prevent anything from burrowing up from the bottom and then the weed cloth to prevent the weeds, grass, etc from coming up. 3. 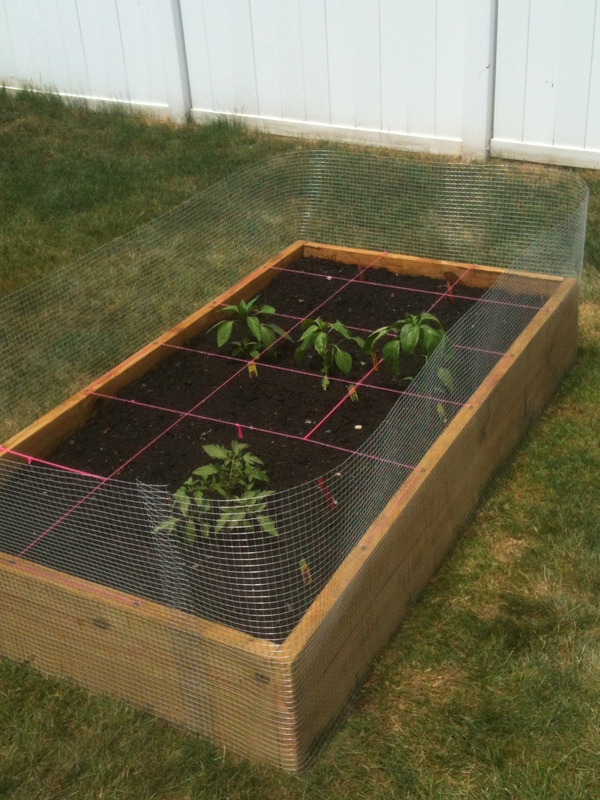 Is it a pain to reach over the chicken wire you have around the boxes when harvesting/planting? Or do you take that off when you do this? This is a yes and no answer. It is only somewhat of a pain when planting seeds or small transplants as I have to reach over and dig a hole. However for harvesting, it is not at all a pain because the crops are much bigger if not sometimes taller than the chicken wire. As you stated in the previous questions, this was my second line of defense for keeping the rabbits out as well. Last year on the very first night after I put my beds together, a rabbit came along and figured my new beds was his personal playground as in the morning, I had freshly dug holes in both my beds. Fortunately for me, I had yet to plant anything so I just turned over the dirt and smooth everything over again. I’m using 1×12 boards which obviously was not high enough to prevent the rabbits from jumping in. Thus the chicken wire which is 24 inches high. I again stapled the chicken wire all the way around so really I only have to reach down 12 inches to the top of the soil level in the beds. If you do decide to go with the chicken wire around your beds, I would suggest you go with the ¼ inch mesh as baby rabbits can easily fit through the ½ inch mesh. 4. Did you have any problems with birds eating the seeds after they were planted? I didn’t have any problems with birds and I planted almost everything from seeds directly into my beds last year. Hello! 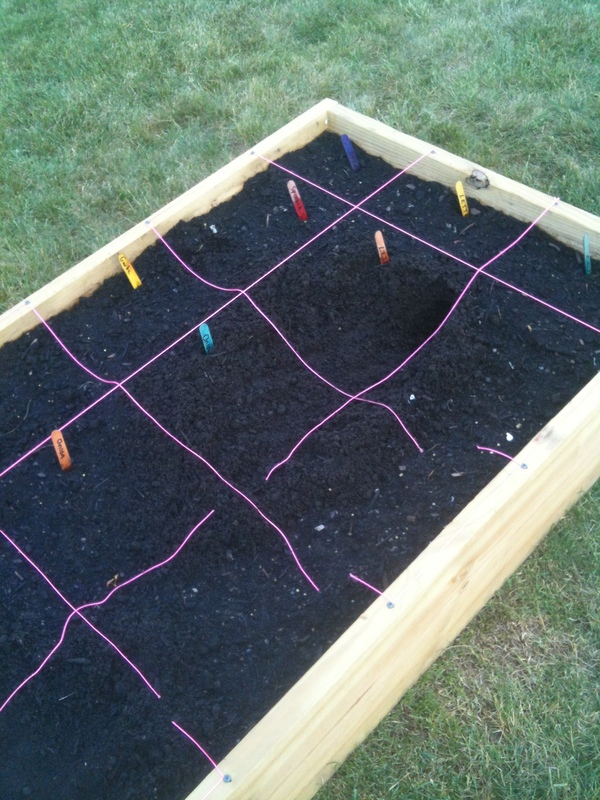 I’m starting a square foot garden for the first time this year, and I live in Shorewood, IL. I’ve read Mel’s book, and have been scouring the internet for tips, ideas, etc., and I especially like to read about people’s experiences who live so close to me. I wish we had a “group” in our area, like a weekly meeting or something, because I feel like I have SOOOO many questions before I do this! Would you mind answering a few things for me? 4 Did you have any problems with birds eating the seeds after they were planted? I made the Mel trellis last year, it was easy to do with 2 people, and it lasted all summer. Easy to take down and store for the winter too. I would not put them in adjacent squares. I think how you currently have them is smart. It helps with air flow more than weight distribution. Those trellis nets are stronger than they look. Your spacing sounds great. You are going to have an awesome year! Thanks for the comments and tips. 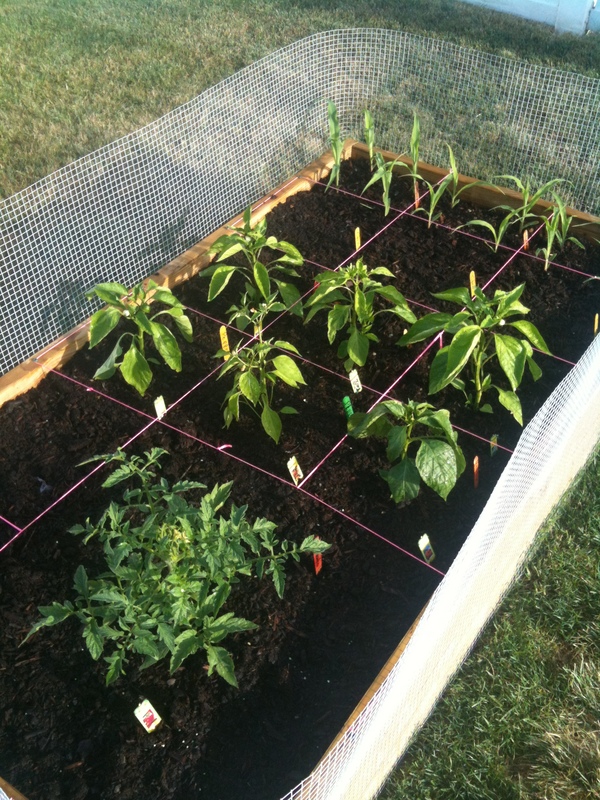 I’ll move the peppers around so different types are not in adjacent squares. I’ll probably mix the lettuce in between and do the same for both boxes. I’ll keep the cucumbers in different boxes, but should I put them in adjacent squares or alternante them with the tomatoes in one box and peas in the other box as I currently have? My thought was that alternating would keep the weight distribution somewhat even on the trellis. Also the trellis boxes, they have about 50 feet between them. There is a patio and lawn between the pair of boxes on the north and the ones on the south. Between each 4×4 and 3×6 box will be about 4 feet. Looks great! My only suggestion would be not to put different peppers next to each other. Pepper plants can cross-pollinate and you come out with “frankenpeppers”. It’s a good idea to *not* keep all your cucumbers together in case one comes down with a disease. If they are all together, it will spread like wildfire. Spread them out to different boxes (like you currently have them). Worse case scenario, you lose a few cucumber plants, but not all. How much space is between the two boxes with the trellises? The box to the far south east may throw a shadow on the box to the north east. If you don’t have a lot of space between the boxes, you might consider moving your trellis to the north west box. I love the little finger carrots!